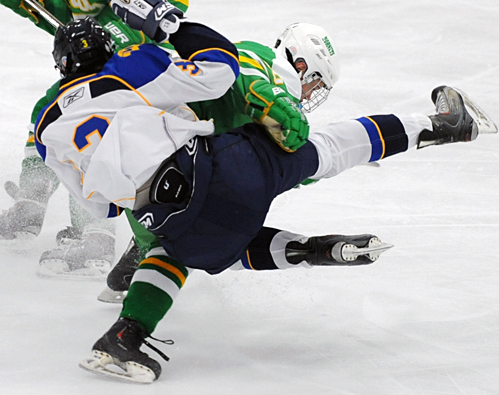 There it was, an oversized zero stuck under the “Edina” on the Plymouth Ice Center scoreboard. It had been there all game, and with just a handful of minutes remaining, it was only natural that the "S" word would go through Wayzata goaltender Andrew McIntyre’s head. “I was definitely thinking about it. Yep.” McIntryre, a senior, said about the possibility of posting a shutout against the defending state Class 2A champion Hornets. 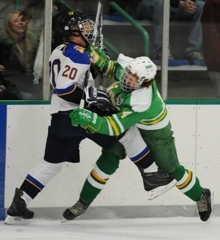 With 3 minutes, 52 seconds left, Edina’s Steven Fogarty ruined McIntyre’s shutout bid. 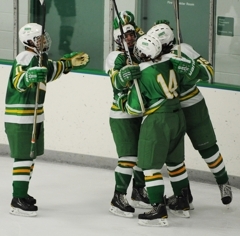 Then, suddenly, there was another Edina goal. This one, by Lou Nanne, with less than three minutes left. The shutout was long gone. Worse, the sure victory now was in doubt. 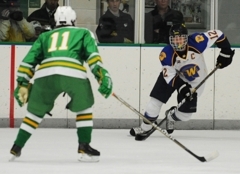 “Macky played great tonight,” Wayzata defenseman D.J. Jones said about McIntyre. “He really controlled his rebounds. He was poised back there, not shaky at all. 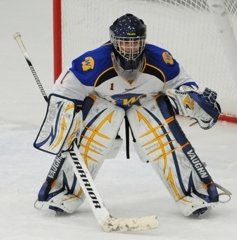 McIntyre’s calming influence – no to mention his blocker, catching glove, arms, legs and various other pieces of equipment and body parts – proved to be enough to lead Wayzata past Edina 3-2 on Saturday, Nov. 27, in the championship game of the Trojans’ Turkey Trot tournament. “Macky really had a solid game,” Trjoans coach Carl Davis said. 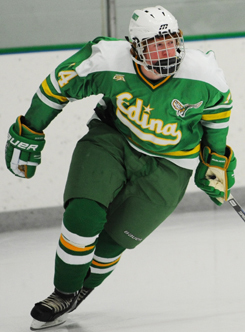 Indeed, McIntyre’s positioning and anticipation were so good Edina’s forward were forced to aim for the smallest of openings. Most of those shots sailed harmlessly, and noisily, into the Plexiglass. 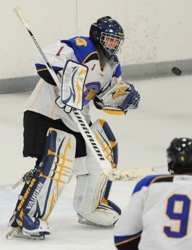 The victory was Step 2 in what McIntyre – who beat Maple Grove 3-2 in the season opener on Friday -- hopes will be a season-long journey to prove he would have been a worthy selection for the Upper Midwest High School Elite Hockey League this fall. 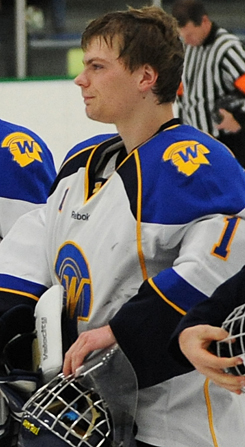 McIntyre went 11-2-2 last season for the Trojans while posting a .915 save percentage and 1.72 goals-against average. 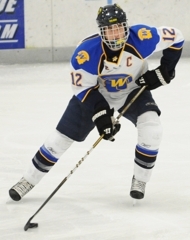 “We thought he should have made it,” Davis said about McIntyre’s Elite League snub. “As you can see, he is a very good goalie. He was very close, probably the next in line. That was my understanding. No one more so than McIntyre. “I knew I was on the bubble there,” he said. “I guess you can just prove it in the season, maybe show them that they made a mistake. 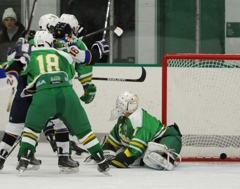 McIntyre finished with 22 saves against the Hornets, including a handful in the closing minutes as Edina ratcheted up the offensive pressure until the puck only left the Wayzata zone on Trojans clearing attempts. While McIntyre lost his shutout, he rarely lost sight -- or control -- of the puck. 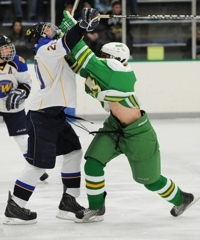 Until the final, frantic minutes, Edina's rebound chances could be counted on a single hand. That was by design, McIntyre said. "I always pick three things to work on before the game," he said, "and that was one of them. I felt good about my rebounds and how I was controlling them." No doubt the win felt good, too. 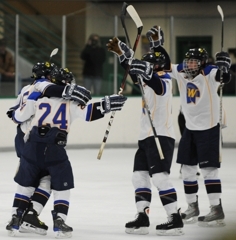 Wayzata has now defeated Edina in four straight meetings, including three last season. The only negative was the lost shutout. 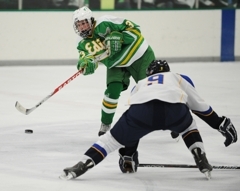 The 6-foot-2, 185-pound junior forward had numerous golden scoring chances, peppering Edina goaltender Connor Girard with close-range shots with Gatling Gun frequency. 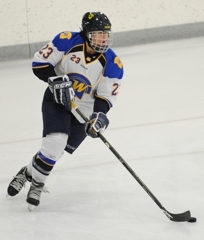 Lucia finally capitalized in the third period on a 5-on-3 power play, putting the Trojans ahead 3-0 with what would prove to be the winning goal. 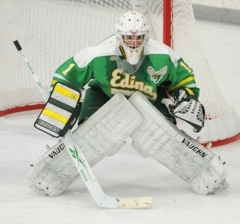 The senior goaltender made 22 saves and played his angles so well Edina’s shooters were working on a razor-thin margin for error. Most impressive was McIntrye’s rebound control, as there were only a handful of second-chance opportunities for the Hornets all game. 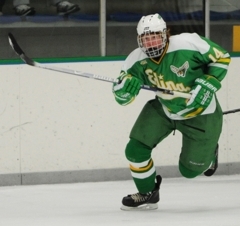 The junior forward didn’t crack the scoresheet but he used his speed and elusiveness to exploit openings all over the ice. 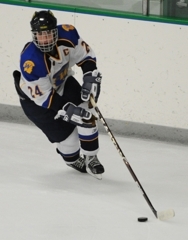 The only flaw in his game was his aim, although as stated above, he had precious little open net to shoot at. 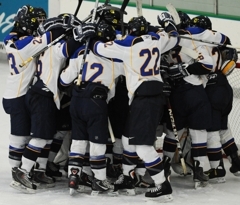 Wayzata surged to a three-goal lead late in the third period then held off a furious Edina comeback attempt to beat the Hornets 3-2 on Saturday, Nov. 27, in the championship game of the Trojans’ annual Turkey Trot Hockey Tournament at Plymouth Ice Center in Plymouth. The matchup of state big-school superpowers was decidedly one-sided until the final 3 minutes, 52 seconds. 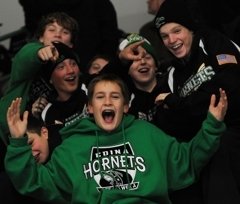 That’s when Edina scored twice to set up a wildly entertaining finish for the more than 1,000 fans who stayed to the end. 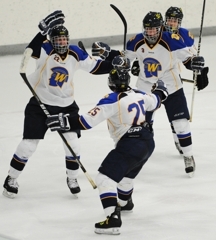 Mario Lucia scored on a 5-on-3 power play in the third period to put Wayzata (2-0-0) ahead 3-0. 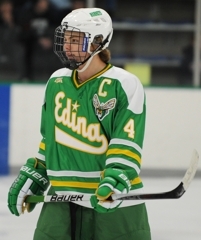 Then Edina, the defending state Class 2A champion and ranked No. 1 to open the season, started its comeback. 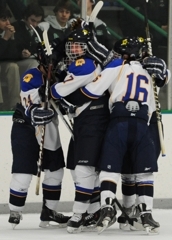 Senior Steve Fogarty scored a power-play goal with 3:52 remaining, and sophomore Lou Nanne added a goal with 2:18 left. 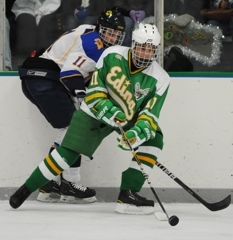 Edina (1-1-0) had several good scoring chances in the closing seconds, including two shots from the point from senior defenseman Max Everson, but the Hornets were unable to get the puck through traffic and forge the tie. 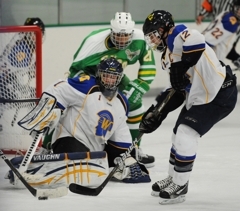 Wayzata goaltender Andrew McIntyre finished with 22 saves, while Edina’s Connor Girard made 28 stops. 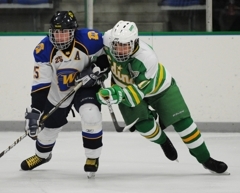 The Trojans beat Edina in all three of the teams’ meetings last season. 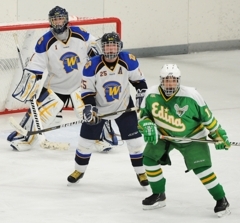 Before that, Edina had won seven straight over Wayzata. 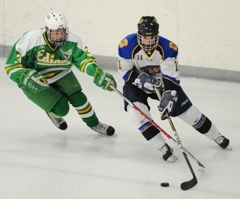 The teams, both members of the Lake Conference, will meet at least two more times this season.